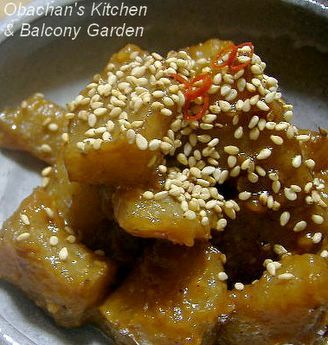 Obachan's Kitchen & Balcony Garden: Konnyaku Day! 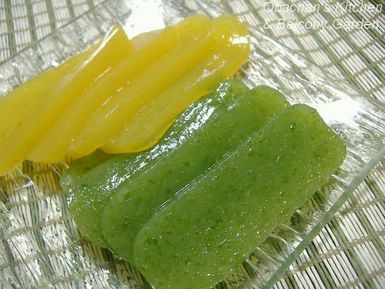 BTW, I wonder how many of the participants decided to join this Konnyaku Day event because they really love this gelatinous food. To be honest, I have never been too crazy about konnyaku. Yes, there were a couple of times that I truly enjoyed delicate and tasty sashimi konnyaku from Kyoto or somewhere. But usually I don’t feel so happy when I find that gray stuff in simmered dishes. Nevertheless, I always include konnyaku in the ingredients when I make oden (Japanese hotchpotch) for a particular reason that I mentioned in my previous post. Now, for this post, I chose something I have heard of but never tried making before. 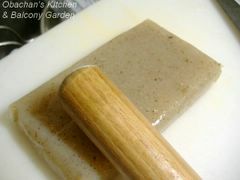 Sprinkle salt over konnyaku block and pound with a pestle or a rolling pin. * Wash and tear konnyaku into small chunks. ** Put them in a saucepan, add water just to cover them, heat and bring to boil. Drain. In a pot (or a frying pan), heat vegetable oil. Add konnyaku chunks and fry for a few minutes. Add miso and heat until the miso is browned and gives out good aroma. Add sake, sugar, mirin, soy sauce and dashi stock. Simmer until the soup is thickened, stirring occasionally. Turn the heat to high and coat konnyaku with miso glaze, shaking the pot. (Add ginger juice, if desired.) 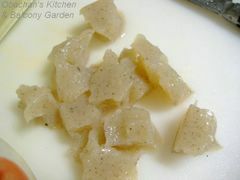 Transfer to plate and sprinkle with roasted white sesame seeds. * I didn’t know this until recently, but this preparation is supposed to let excess water ooze out and make konnyaku suitable for simmering. 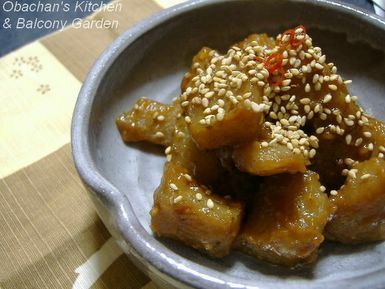 ** Torn konnyaku chunks have ragged surface which allows better absorption of liquid seasonings. I came up with this recipe after combining a couple of recipes and adding my own twists, but still I was not totally happy with the taste. It will taste a lot differently if I use a different type of miso. The way sumiso brings out the flavor of green laver or yuzu is so delightful and refreshing, and it is something particularly enjoyable on a hot summer day. 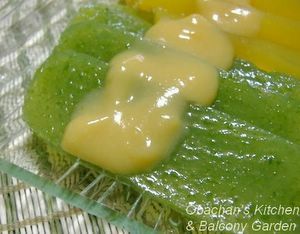 I guess you could make the same kind of food out of gelatin, but I would definitely prefer the firmer and somewhat chewy texture of sashimi konnyaku in order to fully appreciate this very wafoo (Japanese-style) combination of flavors. I love konnyaku. My mother uses it in soups. I think I wanna try out your recipe..thanks. That looks delicious. I'm gonna try your recipe next time. Wow, now I'm immensely jealous. 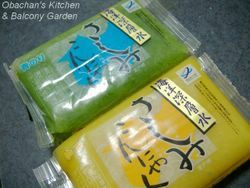 I wish I could find yuzu or other flavored konnyaku where I live! Yeah, konnyaku must be nice in soups. For some reason my mom is not too crazy about konnyaku in soup, but I love konnyaku in kasu-jiru (Japanese soup seasoned with sake lees). Thanks. I guess the taste of this dish would be very different depending on the taste of miso you use, so you might need to make major adjustments. Hope you enjoy this dish. I wish I could make an attachment file of our sashimi konnyaku and email it to you!